In recent years, Translation Studies have played an increasingly important role in the curricula of universities worldwide. The approach taken in teaching both translation theory and practice is mainly interdisciplinary, which echoes the translation turn of the 1990s. Philological translation has apparently given way to a more dynamic and culturally oriented translation approach, reflected in a number of articles in this volume. In Nigerian universities, attempts are being made to harmonize translation theory and practice. A significant role is being played by departments of Foreign Languages, which offer promising Graduate programs in translation and carry out related research. These efforts culminated in a conference on Translation Studies in Nigeria that was held in 2009 at the Obafemi Awolowo University in Ile Ife. The present volume is a selection of papers presented at the conference and offers an insight into current issues in Translation Studies in Nigeria. 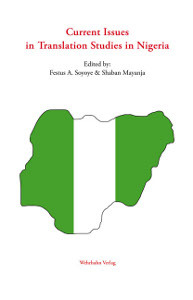 It is hoped that this book will contribute to the ongoing discussion from the perspective of African scholars in Nigeria.